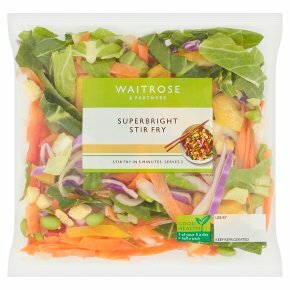 INGREDIENTS: Edamame & Baby Corn mix (27%) (babycorn, edamame beans (soya)), pepper, pinkstar® cabbage, onion, carrot, spring greens. Stir fry. Time: 5 mins. Remove all packaging. Preheat a dry wok over a high heat for 2 minutes. Add 1 tbsp (15ml) of oil and add vegetables. Stir fry over a high heat for 3 minutes until piping hot. Serve immediately.